Eastern Connecticut State University's (ECSU) Goddard Hall and Communications are two interconnected 1960s and 1970s buildings located in the heart of the ECSU campus. Our comprehensive renovation of these two buildings create improved academic spaces, high tech media studios, student lounge areas, and academic offices for five departments. Communications is home to the University’s Communications Department and includes high tech, mass media instruction spaces, a renovated television studio and radio station in addition to general classrooms, seminar rooms, a tiered lecture hall and departmental offices. Goddard Hall includes a Kinesiology and Physical Education suite, research suite for the Department of Psychology, general classrooms, and academic departmental offices. Entry improvements to Communications increase the Communications Department’s presence on campus and shape an expanded lobby and student lounge area. A consistent interior aesthetic unifies the two buildings. Our design introduced bright colors, graphic floor patterns, contemporary furniture and lighting to create a welcoming and dynamic campus hub. Casual seating areas interspersed throughout the corridors complement the academic spaces and invite students to linger. 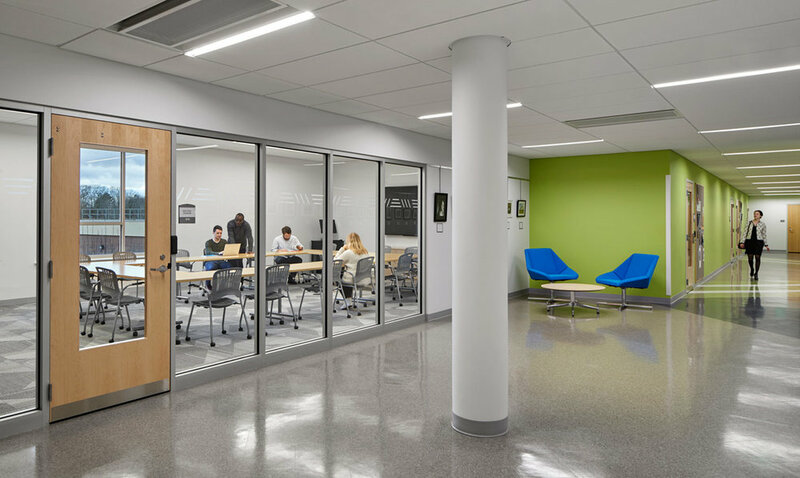 A range of student lounge and meeting areas with fresh interior finishes, furniture and lighting help unify the two buildings and enhance the student experience. The project includes full renovation of building systems, envelope improvements, and is designed to meet or exceed Connecticut’s High Performance Building Standards. 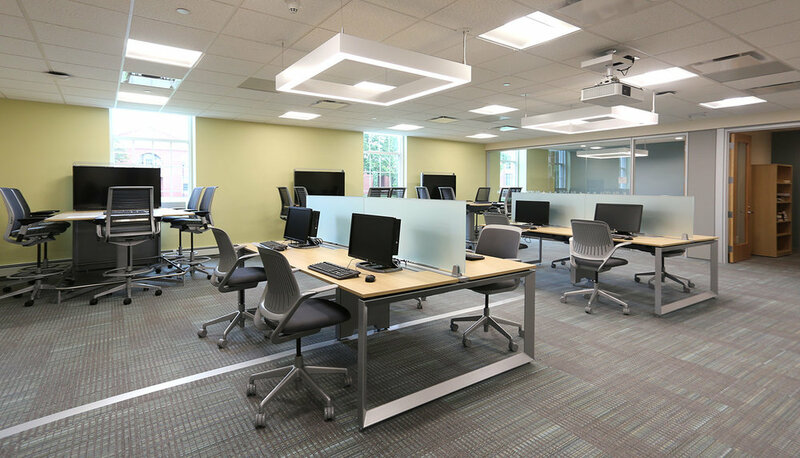 Renovation of the Communications Building (Phase 1) opened for the fall 2018 semester. Renovation of Goddard Hall (Phase 2) is underway for a summer 2019 completion.